Palak (Spinach) Paneer is a vegetarian creamy spinach curry cooked with fried onions, tomatoes, ginger, jalapeños and spices. Paneer, which is indian cottage cheese is cut into small squares, pan-fried till golden brown and added to the curry. 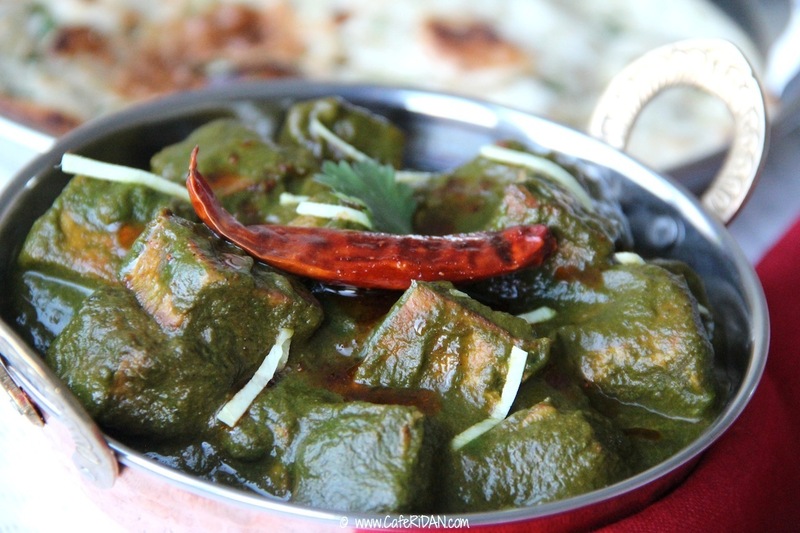 Palak paneer is a dish from North India. It is easy to make, healthy and delicious. Palak paneer is the only way I ate spinach as a child. My mom made it all the time. I learnt this recipe from her just before I got married and have been making it ever since. This is a great dish to make ahead of time. It stays well in the refrigerator for a few days and actually tastes better that way. It freezes very well too. In fact, I always make a little extra to freeze. In this recipe I have used baby spinach, but feel free to use regular spinach if you like. Just remember to trim the stems if they are too thick. This recipe calls for a lot of spinach but it cooks down a lot. I puree the curry in the blender for a smooth consistency but you can use an immersion blender and blend to whatever texture you like. Paneer is available at most Indian grocery stores. After pan-frying, I soak the paneer in a bowl of hot water for about 20 minutes. The paneer absorbs some of the water and becomes soft and spongy. After the curry is cooked, I temper it with a mixture of hot ghee or clarified butter (you can also use unsalted butter), chili powder and whole dry red chilies. You can use just a pinch of chili powder if you do not like too much spice, but I recommend that you don’t skip this step. It adds this amazing smoky flavor to the curry and takes it to a whole new level. The dish is incomplete without this final temper or as we call it in india,Tadka. Enjoy the curry with naan, roti, parathas, tortillas or rice. Here is how I make it. Heat ¼ cup of oil in a pan. Add sliced onions and fry till golden brown and crisp. This should take about 10 minutes. Drain on a paper towel and allow it to cool. To the same pan add the cubes of paneer in one layer. Turn often to make sure all the sides brown evenly. This should take about 7-8 minutes. Once the paneer is evenly browned, remove from pan and transfer to a bowl with 5 cups of hot water. Allow it to soak. Leave the remaining oil in the pan. We will cook the curry in the same pan. Meanwhile, add tomatoes, fried onions, jalapeno and ginger to a blender and puree till smooth. Reheat the pan used to fry the onions and paneer on medium heat. Add turmeric powder. It will immediately change color. Let it sizzle for about 10-15 seconds. Add tomato mixture. Stir a few times till turmeric is mixed in the puree. Cover the pot and allow it to cook on low medium heat for about 15 minutes. Stir every 3-4 minutes so that the puree does not stick and burn. After about 15 minutes you will see that there is a little bit on oil that has separated on top of the mixture. This means it has cooked completely. Add only 1 teaspoon of chili powder and mix well. Add spinach leaves and stir. Allow it to cook for about 5 minutes till the spinach is slightly wilted. Remove from heat and cool for a few minutes. Puree in blender or with an immersion blender till smooth. If you like the leafy texture, you can skip this step and just allow the spinach to cook down. Return to spinach curry to medium heat and drain paneer. Add drained paneer cubes and salt to the curry. Cover and cook for about 10 minutes on medium heat. Meanwhile, heat the ghee in a small pan. Add remaining chili powder and whole dry red chili and cook for 10 seconds. It will change color to a deep reddish brown. Add this tempering mixture to the curry. Sprinkle with garam masala and mix well. Be gentle so you do not break the pane cubes. If at any point the tomato mixture or curry stick to the pan, turn heat down to low and add a couple tablespoons of water. Stir for a few minutes. The spinach does turn color from a bright green to a deep greenish black color. Do not worry, you have not over cooked it. This happens because of the fried onions in the recipe.